16 Then said Samuel, Wherefore then dost thou ask of me, seeing theLord is departed from thee, and is become thine enemy? 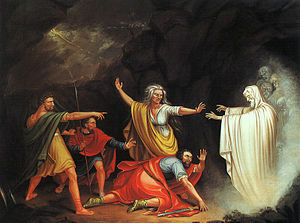 And raise the ghost, whom I shall name, up hither. Dost thou not know what cruel Saul has done? That were wise and could on spirits call? No harm from Saul shall come to thee for this. Whom shall I raise or call? I’ll make him hear. 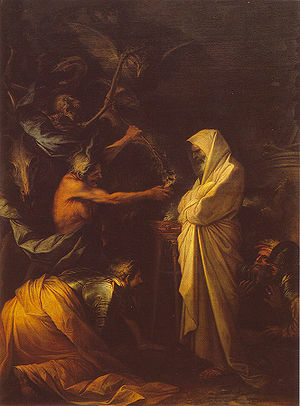 Old Samuel, let only him appear! What, what dost thou fear? For thou art Saul, alas! and hast beguiled me. Peace, and go on, what seest thou? let me know. I see the gods ascending from below. An old man mantled o’er. Oh! that is he, let me that ghost adore. That which I hate? this wicked world and thee? For pity’s sake tell me, what shall I do? Art thou forlorn of God and com’st to me? What can I tell thee then but misery? Thine host shall fall by sword before thy face. Thou and thy son tomorrow shall be with me beneath. 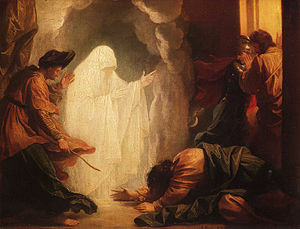 In guilty night: Saul and the witch of Endor, Z134 (published in 1693), composed by Henry Purcell (1659-1695). 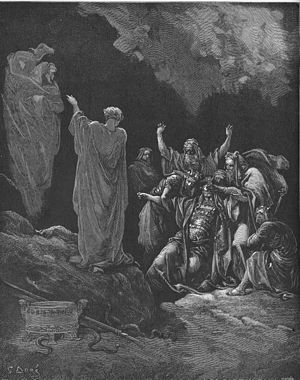 See also: Wikipedia on the Witch of Endor.